Caterpillar Scheduled Oil Sampling (S.O.S.) Services include oil analysis and coolant analysis. The standard tests in the S.O.S. oil analysis include wear rate analysis, oil cleanliness analysis, oil condition analysis and detection of fuel, water and glycol. Additional tests may be performed if needed. Fluid analysis can provide you with an accurate account of the health of your engines, power generators and other major components. This knowledge allows you to schedule maintenance and oil changes more effectively while maintaining maximum reliability. Effective preventative maintenance is estimated to be 3 to 5 times more cost-effective than unscheduled maintenance and repair. In many instances, S.O.S. has detected the need to replace a small part, which has prevented the failure of a major component. Surveys consistently show major benefits for users who regularly use S.O.S. Oil Analysis. A 10:1 payback ratio is common when comparing the amount saved on repair costs to the amount invested in S.O.S. Services. This figure alone is probably conservative, especially when coupled with reduced downtime, greater productivity, and increased used machine value as the analysis identifies potential problems before they become catastrophic failures and cause unplanned downtime. Fluid analysis allows you to schedule maintenance more effectively and extend equipment life. If you are interested in finding out more about this service, contact us today. Our state-of-the-art laboratory is staffed by specially Caterpillar trained technicians, experienced in Caterpillar machines and components. For Caterpillar customers, this offers a major benefit compared to outsourcing from other external suppliers. Our WesTrac specialist technicians know exactly what metallurgical specifications were designed into each part and component. Our team has over 48 years' experience and conducts more than 400,000 oil tests every year. If test results point to a potential problem, you will be provided with carefully outlined recommendations immediately (Available on-line via Oil Commander). What are the benefits of fluid sampling? Our in-house world class fluid testing laboratory can evaluate more than 30 characteristics from each fluid sample. This allows us to gain a comprehensive picture of health of your engine, transmission, powertrain and other wearable components. From each sample, our team is able to evaluate contamination levels, corrosion levels and stability. Regular fluid sampling and analysis through Caterpillar S.O.S.™ Services gives you detailed information about machine fluid condition, component wear and more. 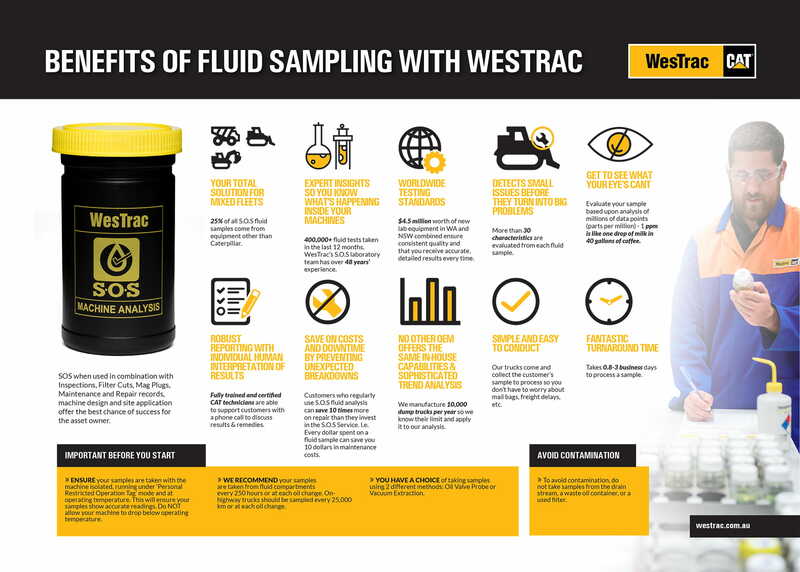 Cat® Fluid Sampling Products help you when taking and sending lab samples. Buy these kits right now on Parts.Cat.Com. Oil Commander provides you with the ability to track, analyse and manage the condition of your fleet through fluid samples. Track results, understand sample interpretations and record corrective action. Potential problems are highlighted visually, allowing you make timely decisions about the health of your fleet.